Viewing the works of Fred Sandback in the somewhat expressive architecture of the Fruitmarket, one feels the benign tension of his work more acutely. On close examination of the installation here in Edinburgh, the works overcome that particular architectural challenge. 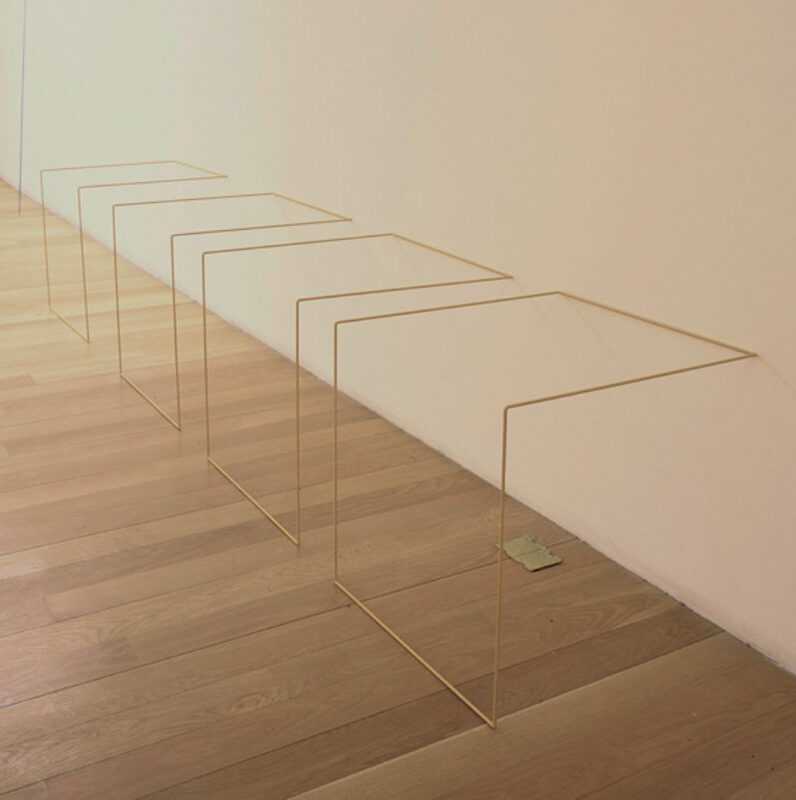 Sandback’s work has often been displayed in surroundings which provide a spatial ‘neutrality’—one which the artist considered desirable. But in contrast to the Kunstmuseum Lichtenstein, where this retrospective was assembled—a building designed by Morger, Degelo & Kere in an attempt at that neutrality—the Fruitmarket provides an obvious challenge to installing and clearing the sight lines for such spatially related work. This is not a detrimental factor, as it does emphasis the strength of the work; in a sense it transcends and controls the spatial consequences of a comparatively small and active space. Particular works here are seen in densities that are unusual for Sandback, bringing interesting crossover groupings which relate the works in specific complexities. In his earlier life as a student of philosophy and art, Sandback would have considered the form of visual tension in a living geometry. His intense interest in playful yet fundamental ‘string games’ and related tactile spatial explorations provide a unique vision. His ‘Children’s Guide to Seeing’ is as good a description in its clarity of concept as can be imagined. In this, the basic considerations—space, sight and touch—are entwined in the ‘Eternal Braid’. Further to the experience of the work, these tactile qualities are related to precepts of ‘visual thinking’, where the very touch and sight of the work combine in a spiral of tender articulation, set and anchored within the universals of built space. In this continuity, established in such a simple form, it is all the more invoking that the nature of the spatial is bounded by human touch and deliberation. Sandback demands the exploration of understanding at the edge of our spatial perceptions. It takes us inside and outside the space at the same time. A kind of transference between eye and hand is made. There is also a notion of self-reflection within the nature of Sandback’s form, where a dialogue is established between the space itself and the perceiver. In his plastic drawing there is an almost contradictory mirroring of a transient complexity. The thought is not far away, or is it embedded in the touch? For touch and its tensile nature are bound in the line, and the line, despite its material modesty, is very much there. It is also there in its extension within direction as a shadow, a vague yet perceivable shadow cast from that tension. The installation develops a sense of what George Elder Davie and Anthony Vidler write on the psychological space of perception. Also—as Richard Tuttle describes in his summoning of Sandback’s double spiral as Sinister or Dexter—some continuity of the ancient is related in the situation that Sandback plays with through modern processes. Yet within the mutual space of work there is a compliance with spherical spatial depth. As Reid observed, ‘if two lines be parallel—ie everywhere equidistant from each other—they both cannot be straight’. Sandback creatively emphasises this with winding strings of colour and the greyness of shadow. Kenny Hunter’s first foray into film—the latest in the MAP commission series. Kate Cowcher introduces the work here.